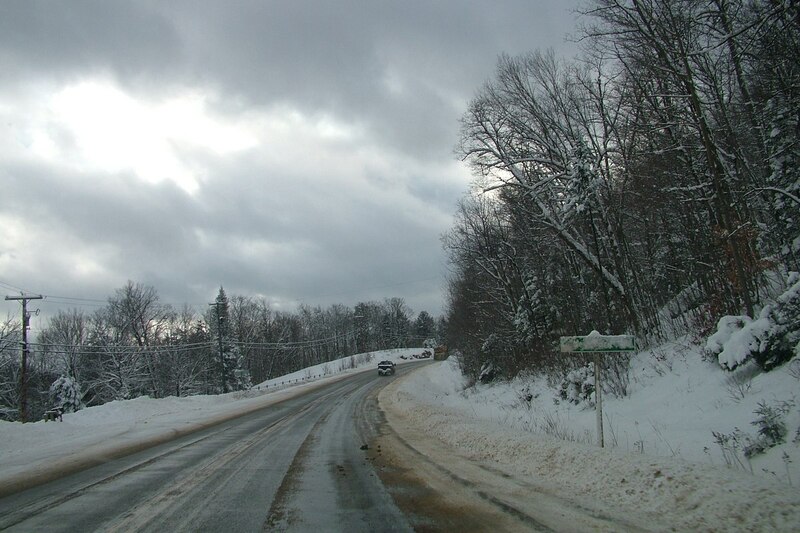 On a windy, snowy day in Ontario, Bob and I headed north towards Algonquin Provincial Park on one of our frequent treks in that direction. It was a particularly stormy day as we navigated the highway, and, as always, we were watching for wildlife. 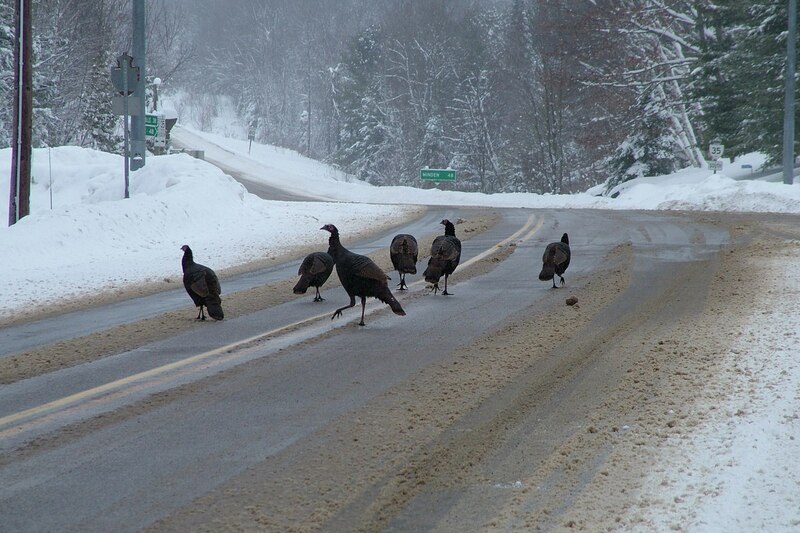 But suddenly we came upon a group of Eastern wild turkey’s on the road. Closer to the park, we found that the road had been ploughed and salt had been applied to help melt the snow. That salt would prove to be the key factor in our finding some wildlife on this snowy trip. 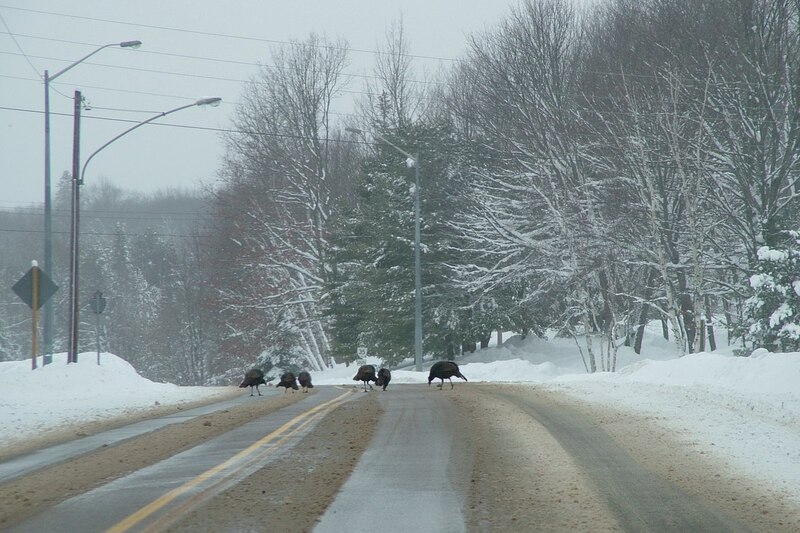 Having headed east towards the village of Dorset, we rounded a corner to find a group of six Eastern Wild Turkeys foraging for bits of salt and sand in the middle of the road. Wild Turkeys eat grass, plants and seeds in the warmer months of the year. They love beechnuts and acorns, as my dad will tell you, but the availability depends heavily upon the season. Beyond eating plant material, Wild Turkeys also will eat animals like mice when plants are buried deep in the snow, and young Wild Turkeys consume large amounts of insects in order to get much needed protein. Wild Turkeys were once a very common sight in southern Ontario, but by 1909, they had been hunted to near extinction. In 1984, Wild Turkeys captured in several eastern U. S. states were released by the government of Ontario back into the forests of our province. The release has proved very successful. 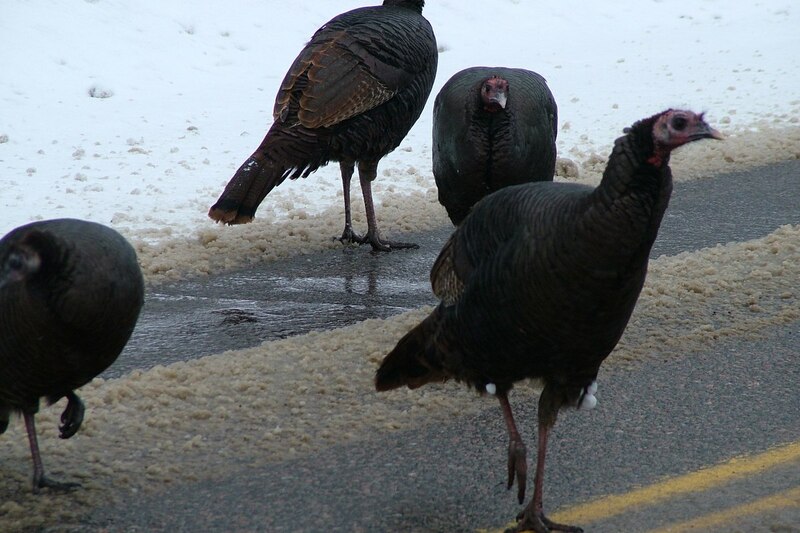 Wild Turkeys have successfully repopulated eastern Ontario, now numbering in the thousands. This reality has pleased conservationists, but unfortunately, this feeling is not shared by many farmers. 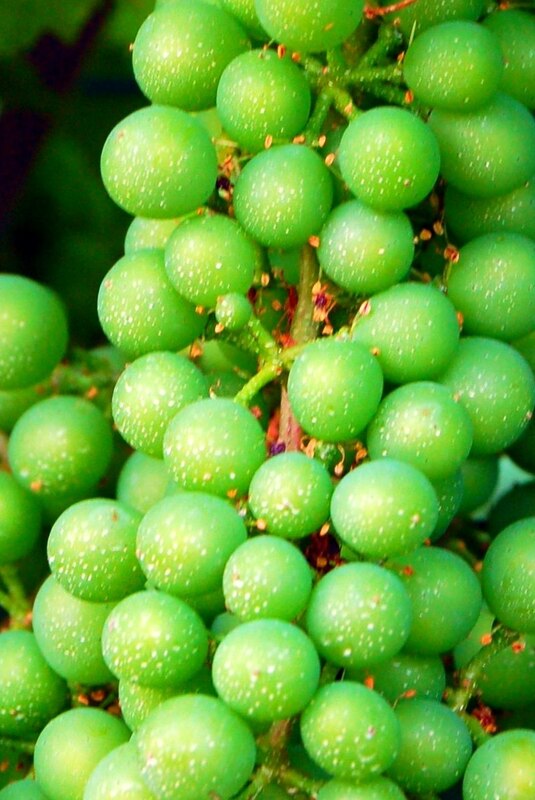 In recent times, near Ottawa, a flock of Wild Turkeys gobbled up thousands of dollars’ worth of white grapes that were going to be used to make expensive wine. As a local Ottawa naturalist said, Wild Turkeys will eat anything at ground level, including wild acorns, and yes, grapes. 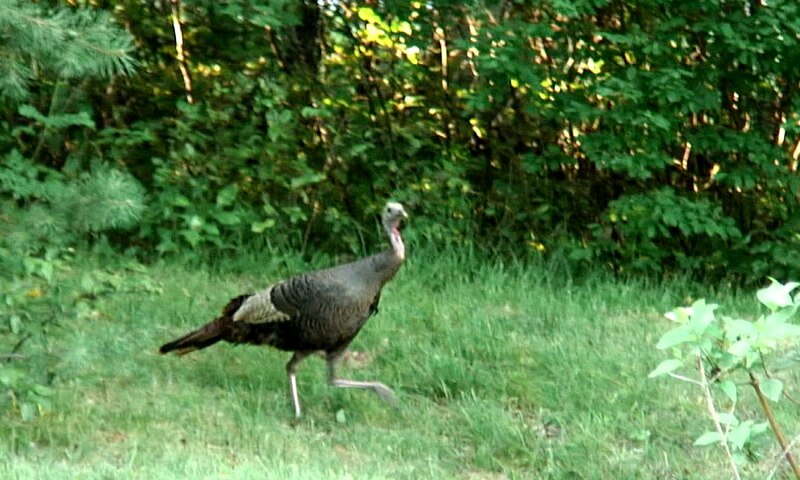 The vineyard is not happy and says it may look to get a permit to hunt the Wild Turkeys. In Ontario, however, hunting Wild Turkeys is legally controlled with just a short spring and fall hunt. It has been about two weeks since the fall hunt ended, and each hunter was only allowed to hunt and take one Wild Turkey. 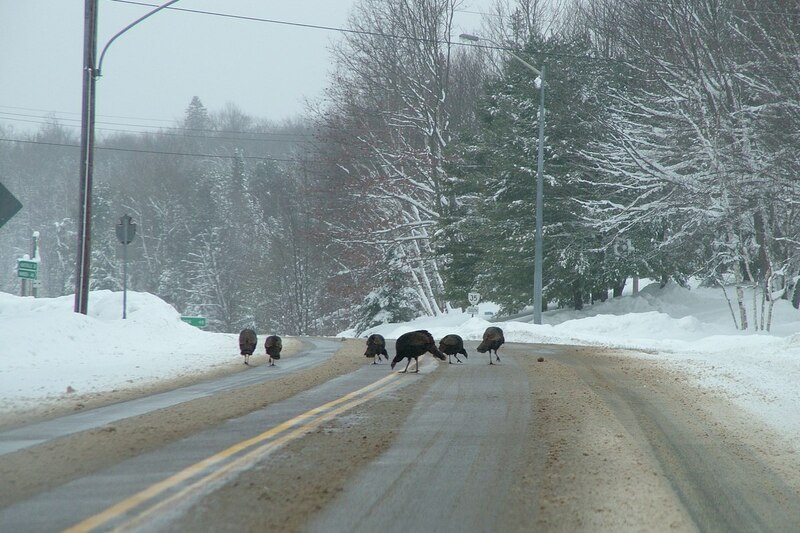 So the Wild Turkeys in Ontario, like those on this winter road, now run free until next spring. 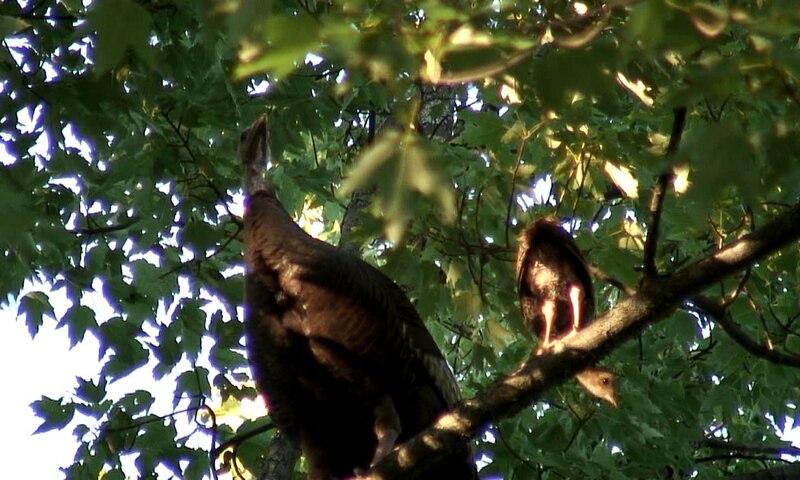 As you will hear in our video, Wild Turkeys make many different types of sounds. 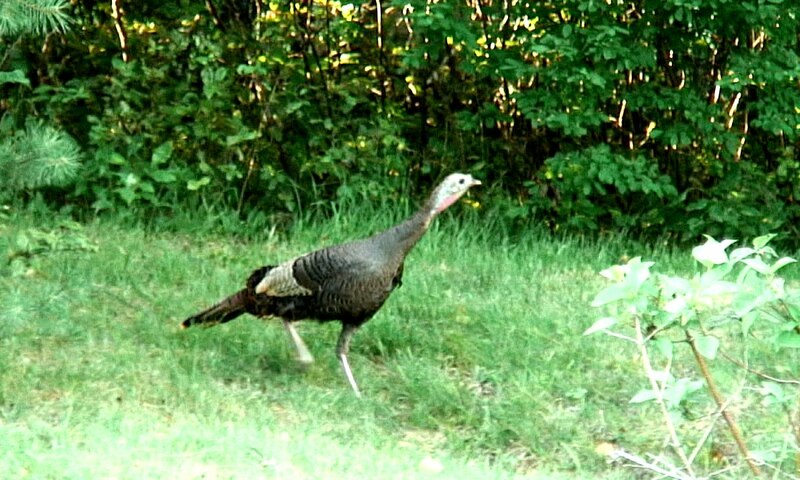 The males, called gobblers, do tend to make the familiar gobble sound, a sound most of us associate with Turkeys. The female hens tend to make a yelp when vocalizing, which is a mixture of sounds used to warn the young Wild Turkeys of impending threats. The male baby turkeys are called jakes, and the female baby turkeys are called jennies. 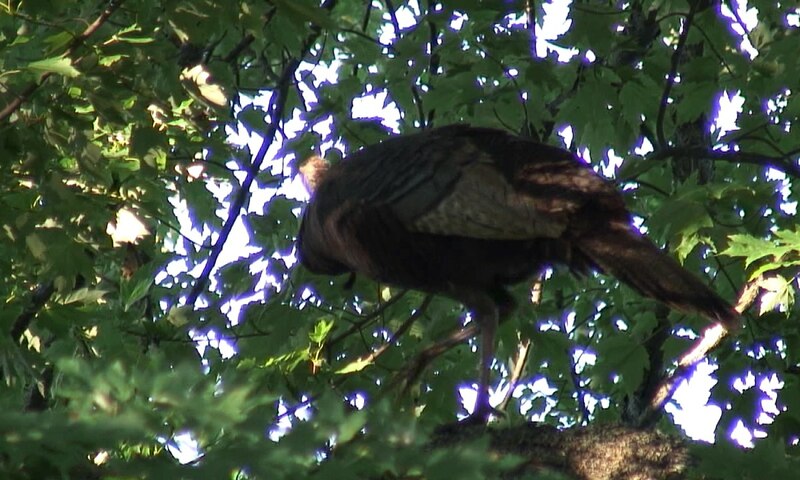 The Eastern Wild Turkey, as you see from our pictures, has rusty-red and greyish-white feathers. Note the snow stuck in the feathers on the leg of the Turkey on the right side. To think there were only a few hundred Wild Turkeys reintroduced into Ontario, and now there are over 80,000 in central Ontario. 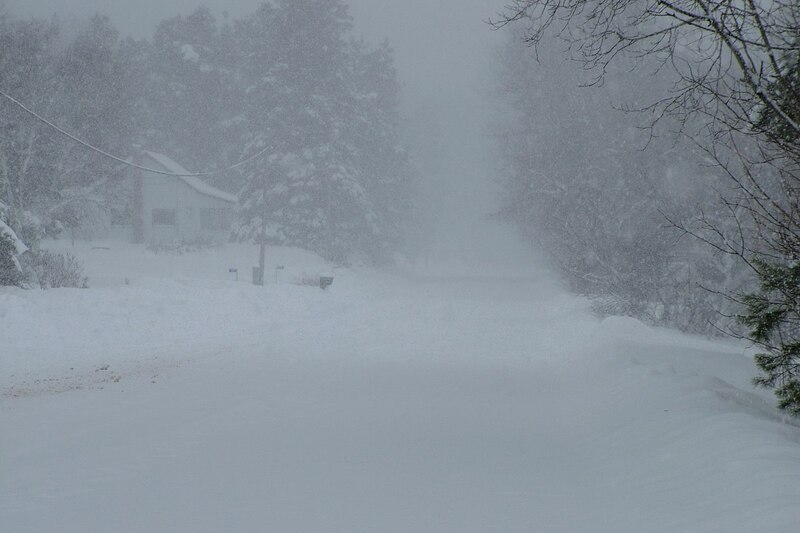 At the end of the day, snow once again engulfed us, but we had reached our destination. Months later, we returned to the same area near Algonquin Provincial Park, and as we set off on a very early morning hike, we were hopeful of spotting some wildlife on the deserted trails. 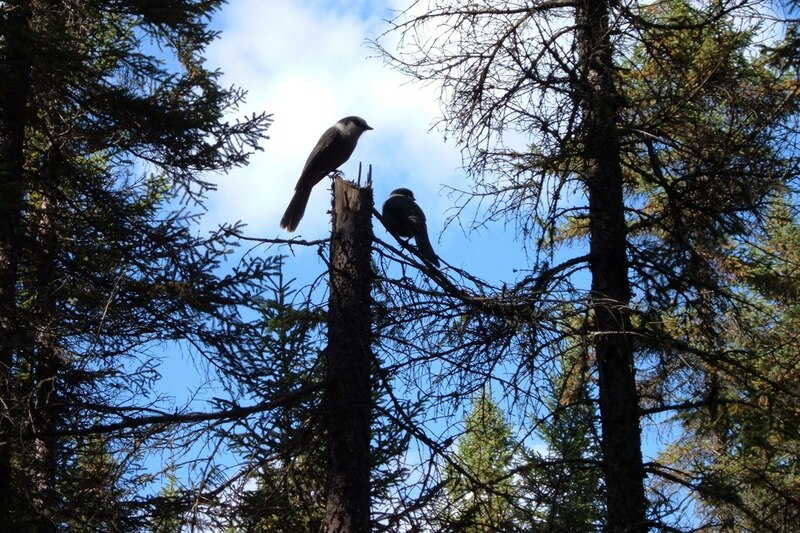 Gray Jays (Cyanocitta cristata) accompanied us as we tread quietly through the bush, and we soon spotted two of the friendly birds perched at the top of a tree. These are a long-tailed bird similar in size to a Blue Jay. A friend of our family, Dan Strickland, has been studying Gray Jays in Canada since 1967. From 1979 to 2000, Dan was Chief Park Naturalist in Algonquin Provincial Park, and has a long list of other wildlife that he has studied over the years. During those years, Dan has done major research on Gray Jays, work that still continues. Today, Dan is considered the world’s leading expert on Gray Jays, and according to “The Science Behind Algonquin’s Animals“, his “is now considered one of the world’s longest-running investigations of a population of color-banded birds”. 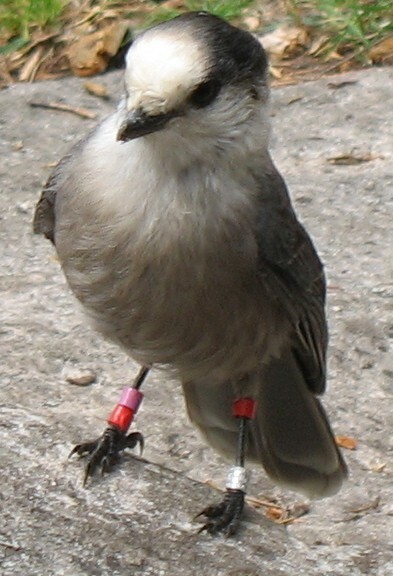 It is not uncommon for Gray Jays, or Whiskeyjacks as they are also called, to light on a person’s hand when food is proffered. Although we saw no other wildlife on our very long hike, later the same day, we did come upon a Wild Turkey running along the ground near Oxtongue Lake, not far from Algonquin Park. The Wild Turkey soon flew high into a tree, and as it took to the air, then landed, we had an opportunity to see its tail feathers. Wild Turkey tail feathers are considered a powerful medicine by most First Nations people in eastern North America. The feathers are also considered symbols of wisdom. Most Wild Turkeys like to live in and around forests with tall trees. 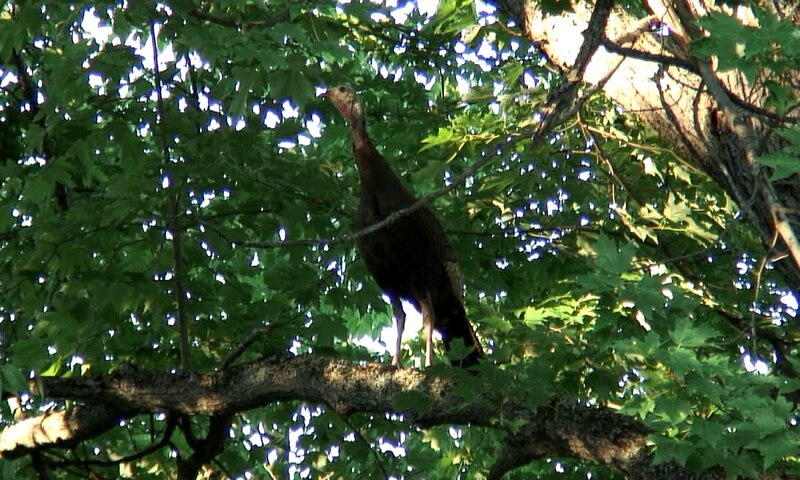 At nighttime, Wild Turkeys will roost up in a tree, often spending the whole night there. 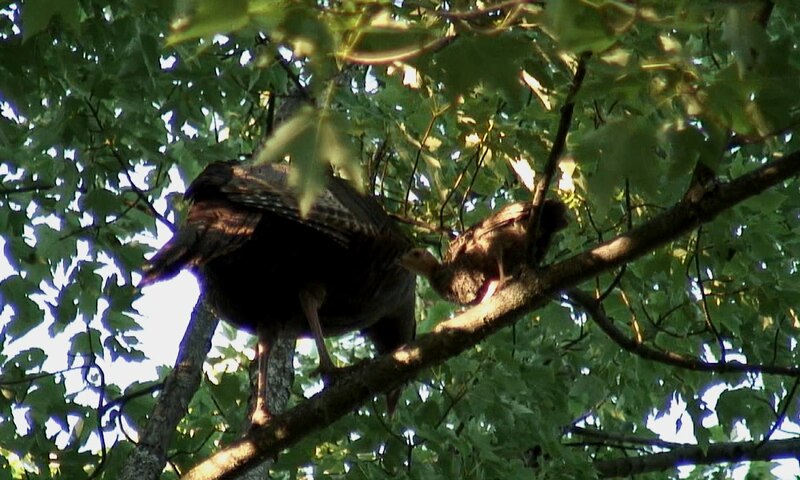 As we watched the hen, a baby turkey flew up into the tree to join her. Hens normally remain on the ground when incubating their eggs, and they stay on the ground until their young learn to fly. 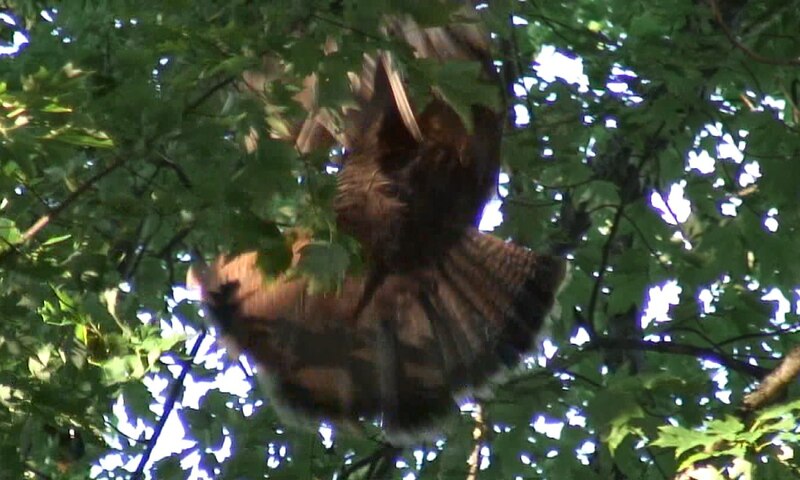 In this video that we filmed, you get a chance to see the hen on the ground and as she flies into the trees. 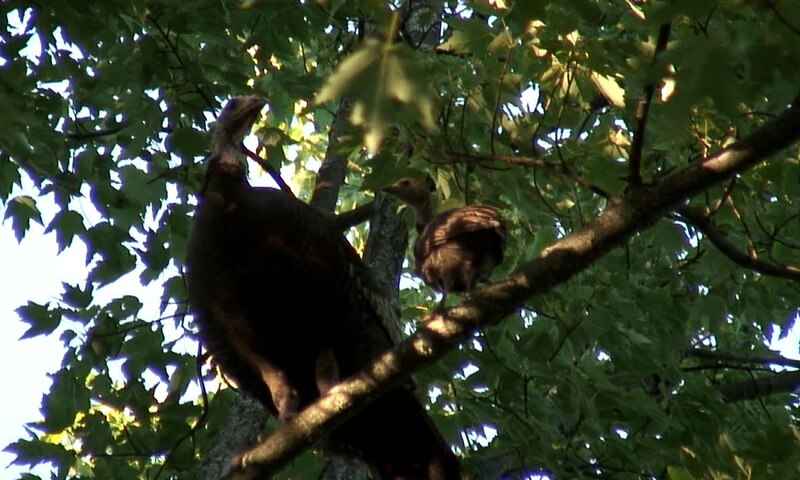 You will also see the young turkey fly in, landing precariously on the mother’s back, then moving to the branch beside her. I’m sure it was celebrating its regained safety and security. 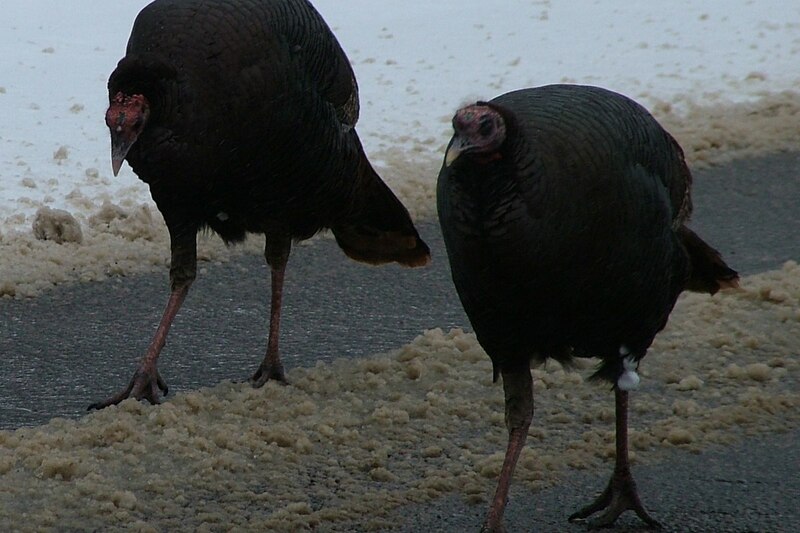 We were very lucky to document these Wild Turkeys both in the winter and in the summer. Wild turkeys are considered very smart birds, that are very alert to their surroundings. Indeed, this hen followed her instincts, and with a potential threat nearby, she took to the high trees and called in her baby. 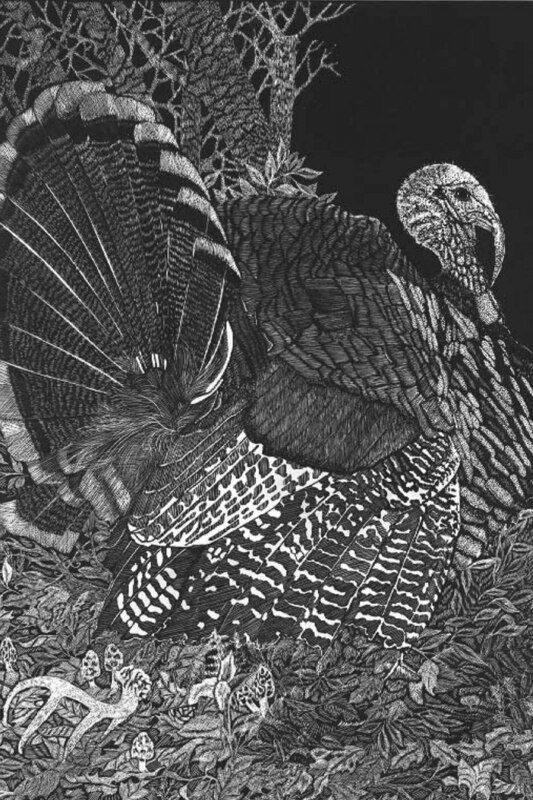 Without a doubt, Wild Turkeys will remain a big part of North American culture and history. Each Thanksgiving, they will continue to play a key role in the celebration of that event going as far back as the days of early settlers, when my family came to Canada. Unusual lack of fear of humans. It’d be good to condition them to be afraid of the highway and people. They’ll stay away from the highway once 1 or 2 of their flock are killed by automobiles. They’ve developed ways to survive over millions of years, but automobiles are recent additions to the landscape. They like the roadway for the grit they need for their crop (craw). Nice filming! I’d speculate this was a year old hen, since she only has one poult left. Experienced hens generally have 3 or 4 poults survive (out of the original 10 or 12 eggs), but there’s no way to know for sure. This brood may have met some unusual calamity. Oh, I love these!! We get lots of wild turkeys in our fields after the crop is taken off. THey have a real thing for soybeans. I always see a mama turkey and her babies in the fields in summer, too. Love Gray Jays. I remember hand-feeding them when we lived in BC. 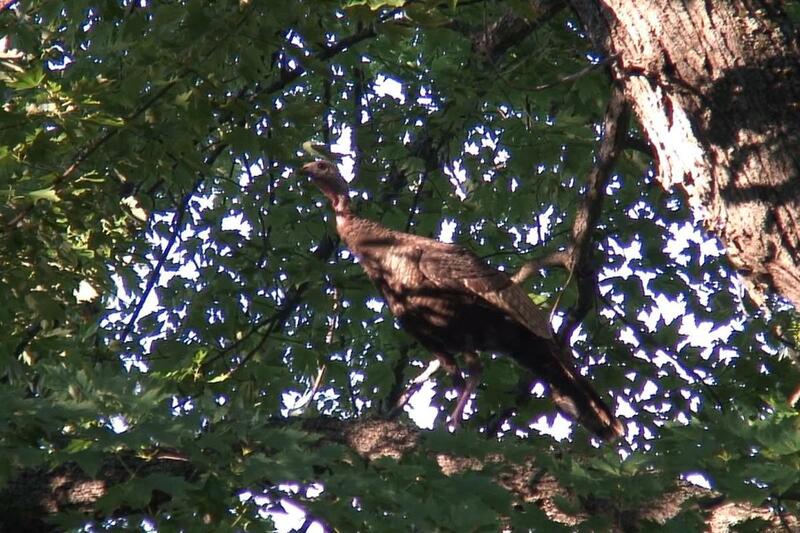 In recent weeks, Bob and I have been able to observe Eastern Wild Turkeys a little closer to home. When visiting the Lynde Shores Conservation Area in Whitby, a whole flock of them greeted us on the hiking trail. As well, north of Toronto, we have seen several numbers of them scouring the snow-covered fields in search of something to eat. You are lucky to have a family of the turkeys in your fields. Looks very cold there! It was cool seeing the turkeys on the road and in the trees.. 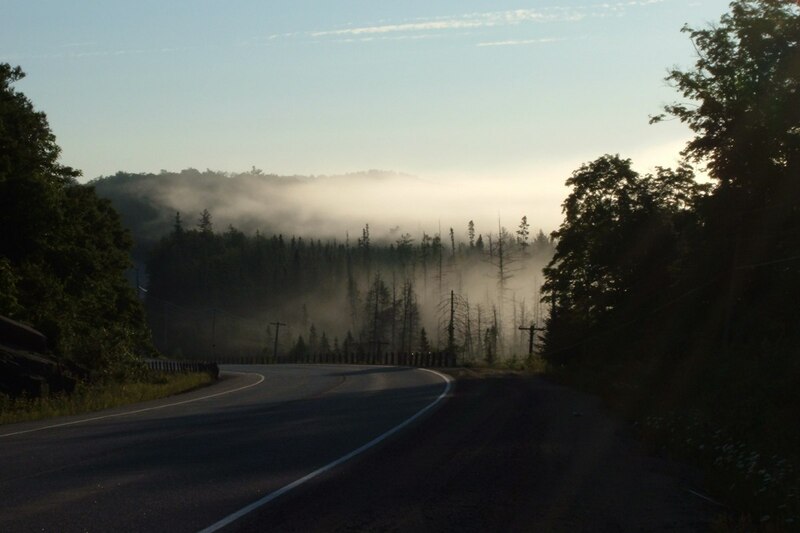 I have heard a lot about the Algonquin park. Sounds like a nice place to visit. I am glad the hunting season for turkeys had ended and they are safe for awhile. 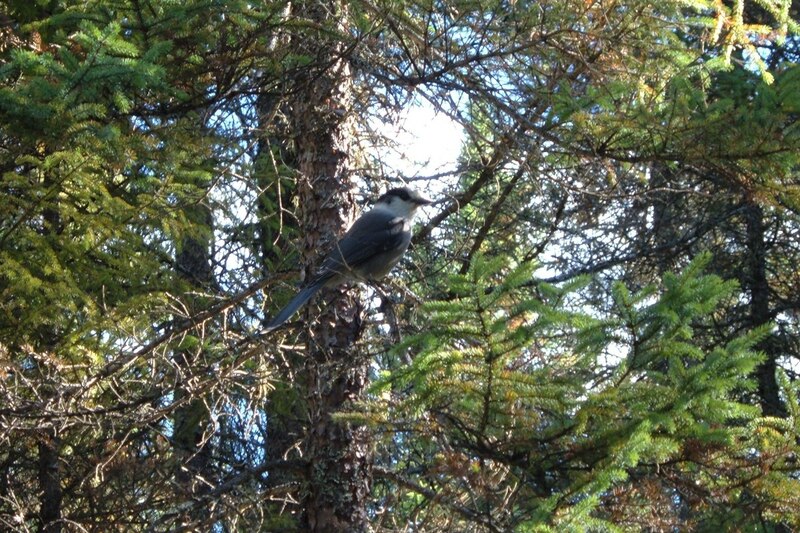 The Gray Jays are beautiful, I have been lucky to see some on my trips. We have visited Lynde Shores Conservation Areas in Whitby a few times this winter, and there are generally numerous Eastern Wild Turkeys visible in the bush and along the trails. Yesterday, some people were actually feeding some of the turkeys out of their hands. Those ones have found a safe place to spend the cold months of the year. I’ve been living in Southern Alberta for forty years and have driven on the highway from Calgary to Banff numerous times, never have I seen any birds on the road. I must admit I’ve only started birdwatching in Sept. of this year. So from now on, I’ll be paying extra attention on the road. Your photos are astounding. 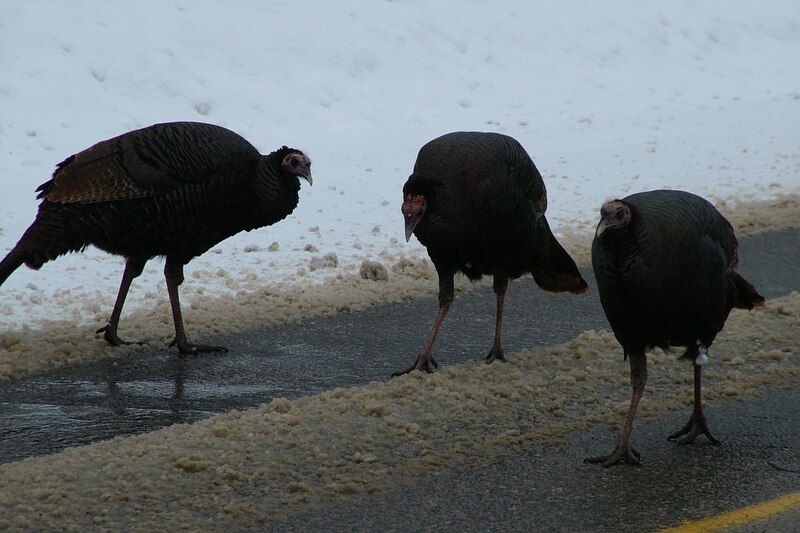 I am wondering whether or not you have seen any wild turkeys yet. We have had occasion to see lots of them this winter. A local conservation area has a huge flock that reside in and amongst the forest of trees, but also, when driving north from Toronto, we have seen turkeys occupying various farm fields, obviously scouring the soil for leftover tidbits of grain and corn. Once, a group of 5 flew right across the highway in front of us. We wished that our camera had been handy. Interesting article and trip for sure. Learned a few things about wild turkeys. thanks. We are learning as we go, too.